Picasso Inspired Jewelry - This is a beautiful artistic sterling silver three-dimensional pendant is accented by a freeform green malachite cabochon gemstone. This handcrafted One-of-a-Kind statement necklace includes a 24" handmade adjustable chain. One-of-a-Kind Necklace. This is a handmade Sterling Silver pendant is created from a plate of silver and square silver tubing. 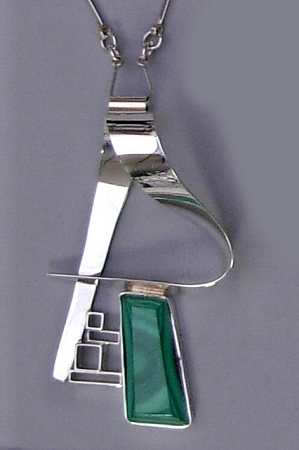 This modern pendant with a geometric touch is accented by a freeform malachite cabochon. This pendant comes with a 24" handmade adjustable sterling silver chain. This necklace is signed and created by Aaron Rubinstein and Modern Art Jewelry.